Carpets of the “Everlasting Daisies” can be found in Kings Park, or growing wild in their masses around Paynes Find. 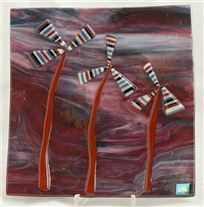 This Panel which can be left in its stand or mounted on the wall is designed to capture their beautiful colours. The wildflower season ranks as one of Western Australia’s most fascinating and precious natural treasures. For several months of each year, wildflowers are scattered across two and a half million square kilometres of terrain. As diverse and colourful as the locals, the uniqueness and natural beauty of the wildflowers attract thousands of tourists and scientists every year. Everlastings make a wonderful show, and this is why I have chosen to leave the triangles proud in this dish. 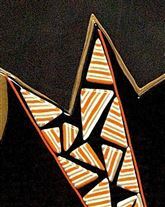 These triangles on this piece are to represent our magnificent flowers. Great for serving cold food when you have guests. (never hot food – I may break), or you may choose to place it on a stand and enjoy it on a side table. A truly unique Piece – a real talking point, can never be repeated! 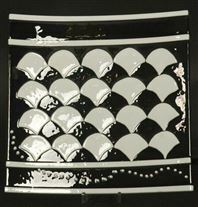 A great piece for your wall or sitting on a stand! It was a long time coming, but spring, glorious spring, is here at last. And what better sign of spring can there be than Western Australia wildflowers. We have one of the most spectacular wildflower displays in the world. The rugged landscape comes alive with a blaze of brilliant colours and lush scents from June to November. 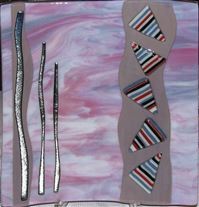 This Glass Paned measures 55x40cm and has its own stand or you may prefer to affix directly onto the wall with mirror clips. It is designed to reflect Spring and our wonderful Everlasting Spring Flowers that are already blooming in Western Australia in September. In fact, we have one of the most spectacular wildflower displays in the world. The rugged landscape comes alive with a blaze of brilliant colours and lush scents from June to November. The handsome Red Kangaroo is the largest living marsupial and are reddish brown in colour with white tipped tails. At 10.59a.m.on the 14th October 1968, the small town of Meckering, about 130 km east of Perth, was destroyed by an earthquake. The magnitude of the Meckering earthquake was 6.9 on the Richter Scale making it one of the largest recorded in the seismic history of Australia. Meckering, about 130 km east of Perth, was destroyed by an earthquake. The magnitude of the Meckering earthquake was 6.9 on the Richter Scale making it one of the largest recorded in the seismic history of Australia. Various forms of football were played in Australia as early as the Victorian Gold Rush. The codes have changed over the years and now every weekend in every corner of Australia fans make their way to see their favourite teams battle against their opponents. When I look at these black and white pieces, I see different things. The football stands, the crowds with their team colours perhaps Collingwood or Swans, a team huddle, and fans making their way into the stadium. 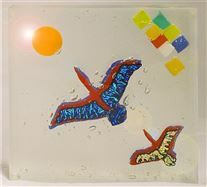 The soaring of the Magpie Geese has been captured in this glass block. 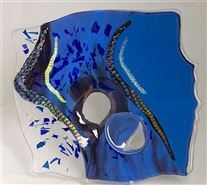 Extroardinarily difficult to make, having to cut most of the 15 layers of glass that have been sandwiched together to create this three dimensional piece. Each piece is cut to place part of the image at a different level and has to fit perfectly and be perfectly clean at every stage. When completed it spends 5 days in the kiln so it can fuse together. This is unique, and pieces of this nature are indeed rare.